Writing at the end of the 13th century, the liturgical commentator William Durandus notes as one of the special privileges of St Lawrence that he is the only martyr whose feast has a vigil, a custom which he shares with the Virgin Mary and the Apostles. More anciently this was not the case; the Gelasian Sacramentary also included vigils of the martyrs Gervasius and Protasius on June 17th, and of Ss John and Paul on June 25th. 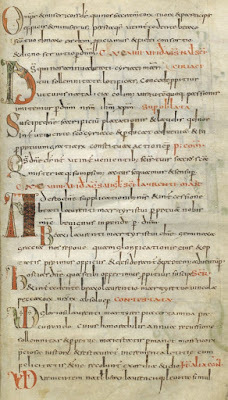 However, these had already disappeared from the Gregorian Sacramentary by the mid-9th century, and the fact that St Lawrence’s vigil was retained certainly indicates the universality and importance of devotion to him; it remains even to the present day in the liturgical books of the Extraordinary Form. The same ancient sacramentaries have vigils for the Assumption, the birth of St John the Baptist, Ss Peter and Paul, and St Andrew; they were later given to the other Apostles whose feasts occur outside Eastertide, and to the feast of All Saints. 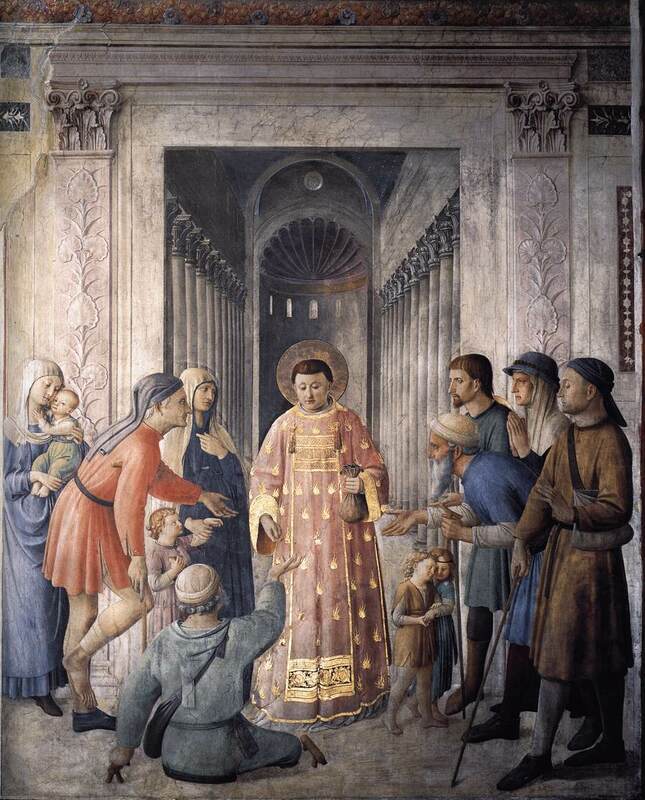 St Lawrence Distributing Alms to the Poor; fresco by the Blessed Angelico from the Chapel of Pope Nicholas V, 1447-49, now in the Vatican Museums. 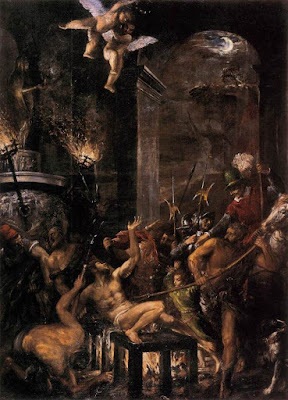 The Martyrdom of Saint Lawrence, by Titian, 1567, from the Spanish Royal Monastery of the Escorial. The Gospel, Matthew 16, 24-27, appears in the same lectionary only on the vigil of St Lawrence, but was later extended to the Common of a Single Martyr. (Commons of the Saints had not yet been created as a feature of Roman liturgical books when the Wurzburg lectionary was written.) 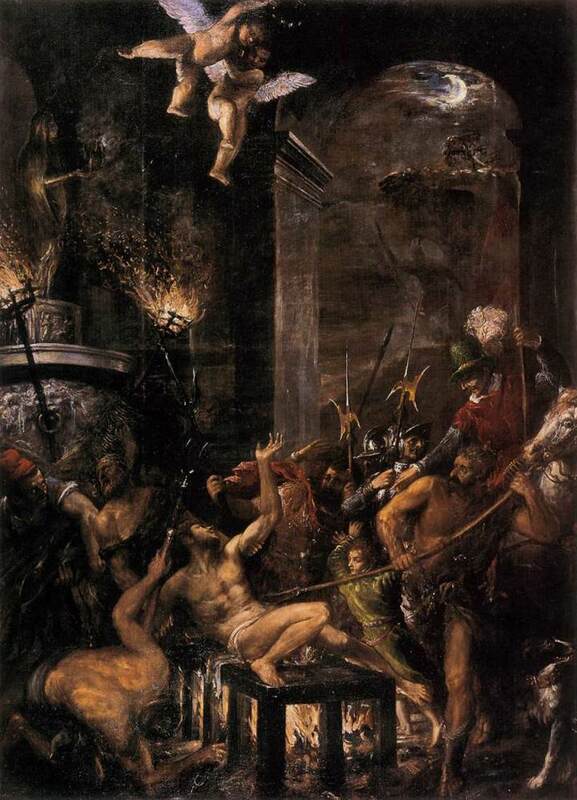 The first line, “If any man will come after me, let him deny himself, and take up his cross, and follow me.”, may have been chosen in reference to the story of St Lawrence’s martyrdom, as told by St Ambrose. 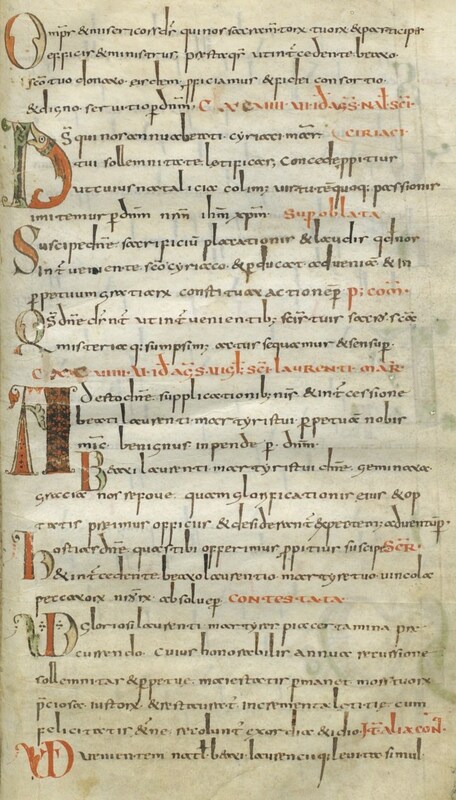 The Gelasian Sacramentary also contained a Preface for both the vigil and feast of St Lawrence, of which the former reads as follows, a lovely exposition of the reason for celebrating the feasts of the Saints every year. 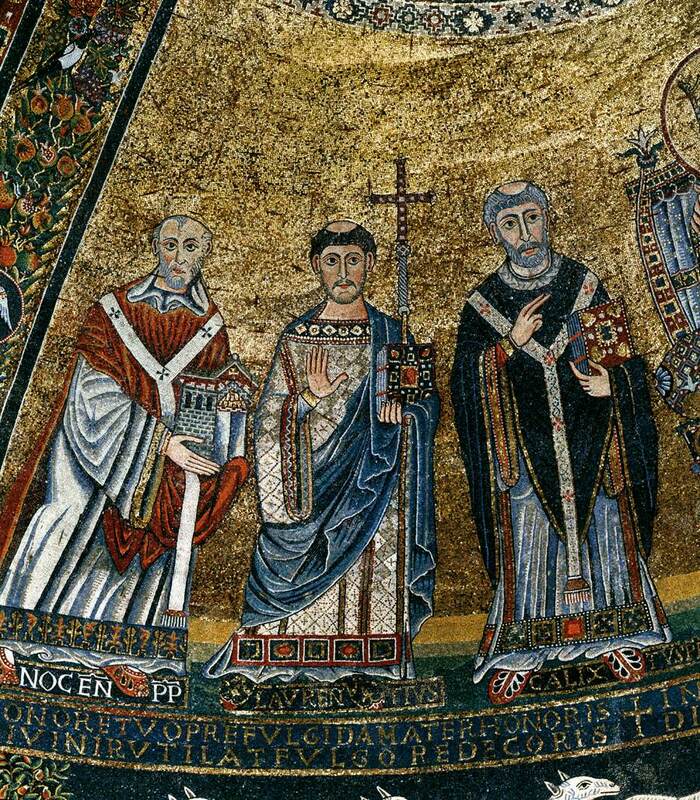 Part of the mosaic in the apse of Santa Maria in Trastevere in Rome. 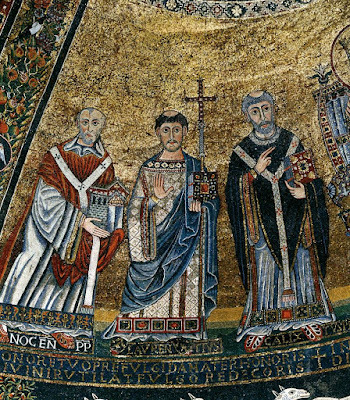 St Lawrence, in the middle; on the left, Pope Innocent II (1130-43), who built the church, presents to Christ; on the right, Pope St Callixtus I (ca. 218-22), who was martyred in the neighborhood of this church, and whose relics are kept in it. The 1960 reform of the Breviary added to the vigil of St Lawrence a completely anomalous feature, something which had never existed before, and does not exist anywhere else; it is the only vigil that has Vespers. A vigil is a separate liturgical observance from its feast, and traditionally, all feasts began with First Vespers, and so a vigil by definition ended once None and the Mass were celebrated. In 1960, however, all the feasts of St Lawrence’s rank lost their first Vespers. His vigil somehow managed to survive the massacres of 1955 and 1960, but as the only vigil attached to a feast with no First Vespers. In order to cover the gap between the vigil and the feast, which now begins with Matins, the vigil was extended to include Vespers; these consist of the regular Office of the feria, but with the Collect of the vigil. For no discernible reason, the series of versicles known as the ferial preces, which are characteristic of penitential days, are omitted from all the vigils in 1960. The vigil of the Epiphany, which as part of the Christmas season is not a penitential day, is celebrated in a different manner from the vigils of the Saints. It traditionally had First Vespers, on the evening of January 4th, but ended like the other vigils after None. Many medieval Uses extended this custom to the vigil of Christmas as well, but this was not done in the Roman Use. By 1981, when the Ambrosian Liturgy of the Hours was promulgated, this change was recognized to be a mistake; the modern Ambrosian Office has First Vespers for all feasts, and celebrates Solemnities with Second Vespers.